Today was a great day for the Canadian Team. 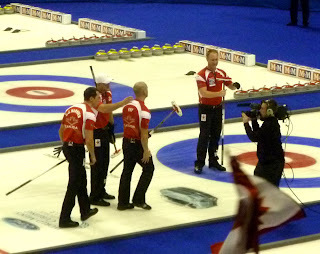 After beating Denmark in the first playoff game they moved to play Scotland in the afternoon semi-final. They won that game and are now just one win away from a Gold Medal. Go Canada Go. Today we won and the sun was shining....how good does it get! Tomorrow it is gold for Team Canada...go boys go! For more photos from today, go to our Facebook page.